I needed to leave Kingston. I needed to see the sea. I needed to inhale vistas far removed from my normal life view. Ahhh…the magic of a road trip. So we agreed. Saturday, we’d depart home at 9am and head west. We’d take the kids to the Jamaica Zoo in Lacovia St. Elizabeth and then head south from there for sea, food and rum at Jack Sprat in Treasure Beach. We figured we’d return to Kingston between 8 and 8:30 pm. Fantastic. All we’d take is swimming things, drinks, water and snacks. Two stops for ice and cash before leaving Kingston were all that was needed. Off we went! Decided to get gas in Osbourne Store, Clarendon as that is one of the 3 cheap gas spots in the island. The other two are Heroes Circle and Portmore just as an FYI. Well the PetCom in Clarendon is apparently closed! I’m still peeved that NOBODY on my Twitter timeline knew and found it necessary to tweet this reality before hand! THIS is information that would really make Twitter useful! I knew that the closure of the PetCom would put pressure on the other 2 gas stations in the area. And sure enough, a stop for gas at the Total a few miles on, turned out to be a 20 min wait. And I had no alternative. I bravely (or stupidly) left Kingston with a quarter tank of gas ’cause I’m cheap and I wanted to fill up on Clarendon’s cheap gas. Anyhoos, I filled up (a mere $3,700.00 for my small car!) and we headed out. It was a beautiful sunny day, traffic was light, nuff Babylon was on the road, and motorists for the most part were behaving themselves. We made a pit stop at the top of Spur Tree – are male bladders smaller than female bladders? Then we pressed on west with the best of ’80s dancehall torturing the kids perhaps, but creating idiots of the adults in the front seat as we pretended to be Super Cat and Jose Wales and Johnny Osbourne. Good times! 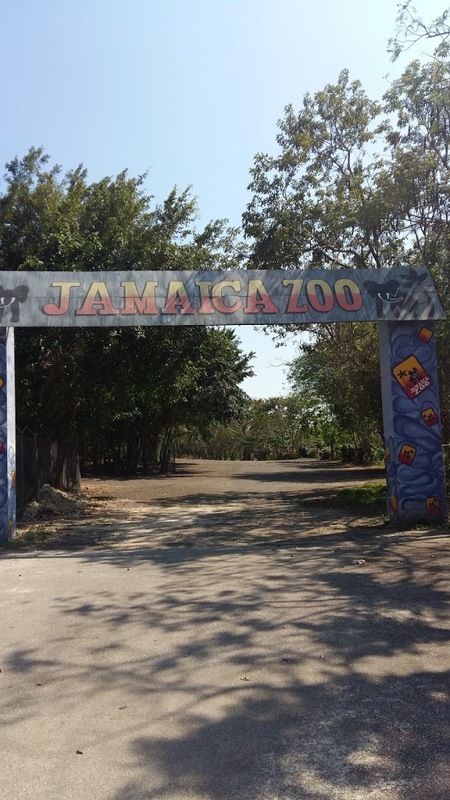 Let’s back up a bit though… Years ago we attempted to go to Jamaica Zoo but when we got there they turned out to be closed. Control Freak that I was (am!) I had a melt down of epic proportions when I realized that my plan and schedule were completely derailed. I am better these days at defining a Plan B upfront and quickly moving on when plans go awry. Nonetheless, in making good on promise to my Bonus Boy made 2 years ago to take him to Jamaica Zoo, I tried to nail down a firm plan by calling ahead to verify opening hours and admission rates and so on. Zero luck. Their social media presence appeared dated and their listed numbers rang without answer or went straight to voice mail. I left messages. No responses. 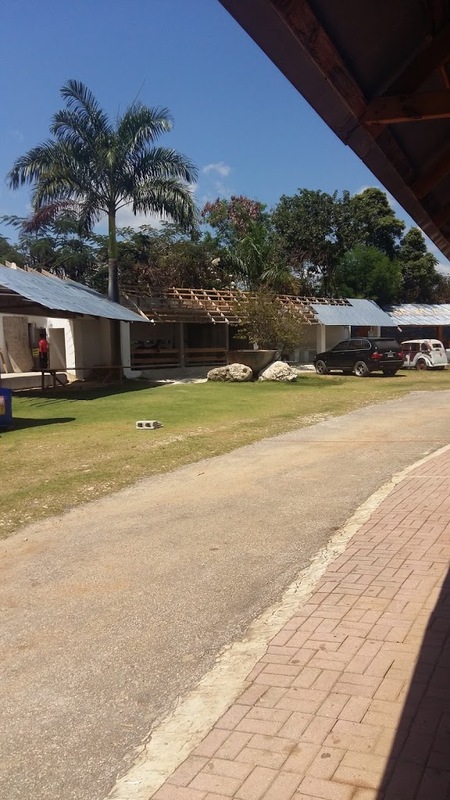 I tweeted the Jamaica Tourist Board account to find out if they were open and no response. Not one to back down, I told H that we’d still head there, and if they were closed we’d simply keep on plan and head south to Treasure Beach but look for fishermen fixing their pots and hopefully hauling in a catch on the fishing beach and turn that into a look-see lesson in Agriculture and Community for the kids. Fantastic. So we get to the zoo. There were signs that ensured we wouldn’t get lost. Good. We pulled up to the huge signed entrance that let us know were had arrived. But the expansive parking lot was empty and overgrown. “Lawx dem lock again!” I groaned. I drove on still, just following the road through all the various opened gates. We drove past a kiddies play area with slides, swings and sea saws. Empty and overgrown. We pressed on and as we went round a bend I saw about 5 vehicles parked on a trimmed grassy area. Ok! Signs of life! We slowed down and pressed on. A smiling young lady with a signed shirt stepped out and welcomed us, confirming that they were open. Awesome! 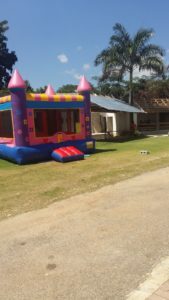 We parked and got out, we were escorted to the reception area where we paid $1,500.00 per adult, $1000.00 per child. 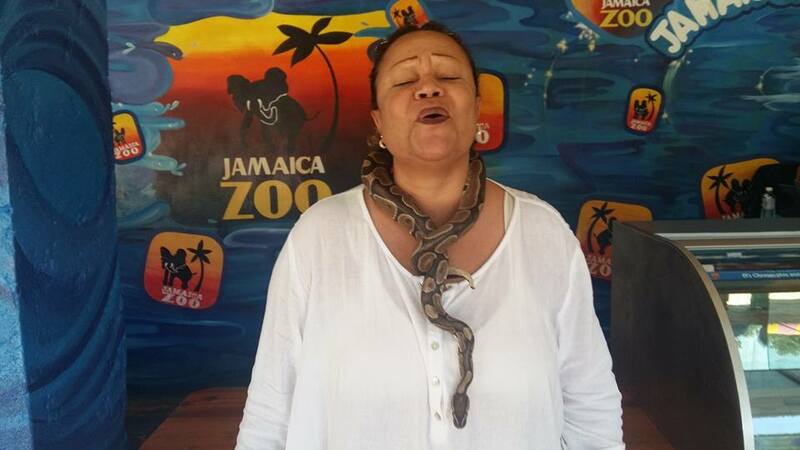 This is where that cash stop came in handy as they don’t take cards at Jamaica Zoo. We spotted a horse, a donkey and a llama from where we were. We saw about 6 beautiful parrots in a nearby tree. Nothing else. Empty stalls and half-finished infrastructural works were all around us. It is a beautiful, expansive property that has an abandoned, pop-down feel. But it was a beautiful day, and we remained curious and relaxed. Our timing appeared perfect as we were immediately invited to take a seat in an arranged area in preparation for what appeared to be a briefing about the zoo. 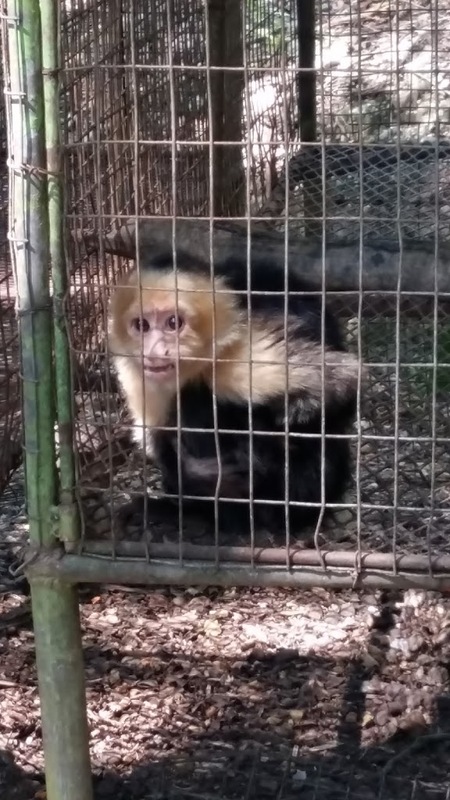 There was a sound operator on a laptop who moved quickly through well chosen, all be they LOUD musical selections (she was on a high stool, completely visible to all) in support of our narrator, a tall, I think Cuban, who it turns out, was our guide to small animals that we would be allowed to touch. It was a catchy, high energy presentation that flowed well if a tad rehearsed, and the children in particular enjoyed the opportunity to touch and have their pics taken. Our group was about 15 in all, and you can imagine that after you’ve gotten your chance to touch and have your pic taken, it becomes a bit of a drag to sit in the church like arrangement while the others go through the same procedure again and again. There was a bounce about across the way from the show, so in between animals, I allowed Bonus Boy to go frolic. And I walked around looking at the parrots and llama and horse enjoying the breeze. That segment took at good hour. 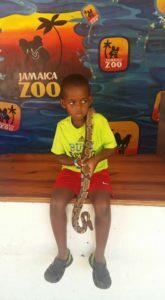 We saw and touched a snake, an iguana, a rabbit, a donkey, a crocodile and guinea pigs. The kids loved it all! 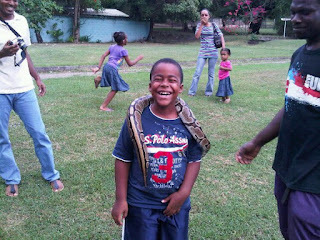 Who’s afraid of Snakes? 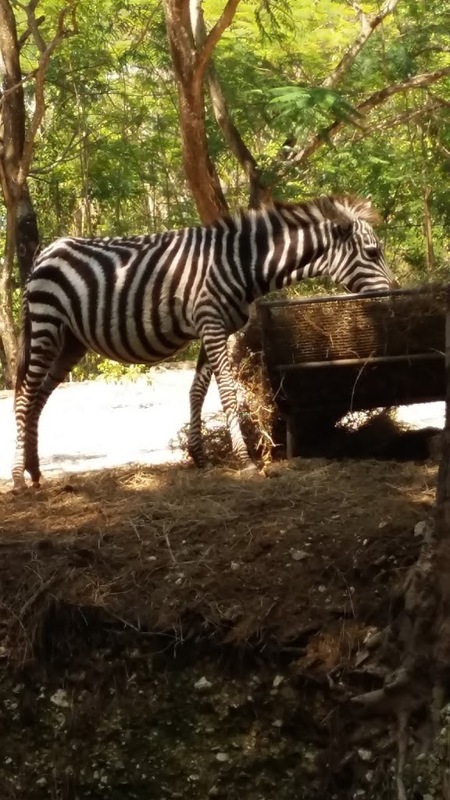 Petting Session at Jamaica Zoo. I refused to look at the snake. Ugh. Little Master completely at ease. 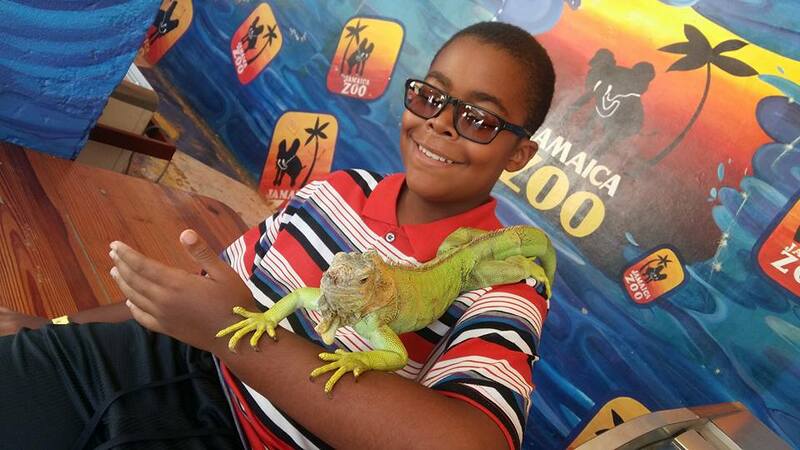 Petting Session at Jamaica Zoo. I’m scared but that won’t stop me! Not to be outdone by Big Bro, Bonus Boy eventually found the courage to participate. Jamaica Zoo Petting session: If they can do it so can I! Big Daddy got in the action having been inspired by Us. El Director handed over to a smiling young woman named Paula who explained to us that she would be taking us on a walking tour to see their other animals. She was calm, pleasant and knowledgeable. The children very easily gravitated towards her. 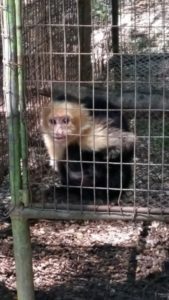 We saw 3 ducks, 2 crocodiles, 4 pigeons, the horse, the llama, 2 spider monkeys, 4 Capuchin monkeys, a zebra and 2 lions. It was a pleasant walk around a gently sloping compound and the kids got to feed the horse, llama, pigeons, ducks and monkeys. I’ve deliberately told you the number of each animal so you can get a sense of the scale of the operation. It was obviously designed to be a grand affaire, but what obtains now is certainly not the vision at conception. The huge scale of the physical plant makes the actual small operation feel kind of derelict and abandoned in parts, and we quickly recognized that to retrofit the operation and bring it all down to a more cosy, controllable physical space would take money. Perhaps adding cabins and a camping site and converting some of the land to the cultivation of cash crops and having a monthly farmers market would inject life and energy and help to sustain the operation which truth be told, appears to be limping along. 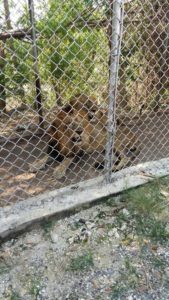 We heard the lions roar as one of the groundsmen provoked him by banging on his cage with his machete. I didn’t like that part much. Neither did my Bonus Boy who hours after expressed concern to me and wondered if the lion had eaten the bad man teasing them. 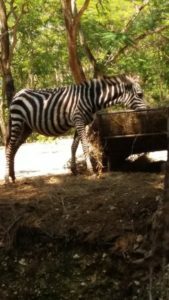 The lonely zebra in his enclosure made me sad. 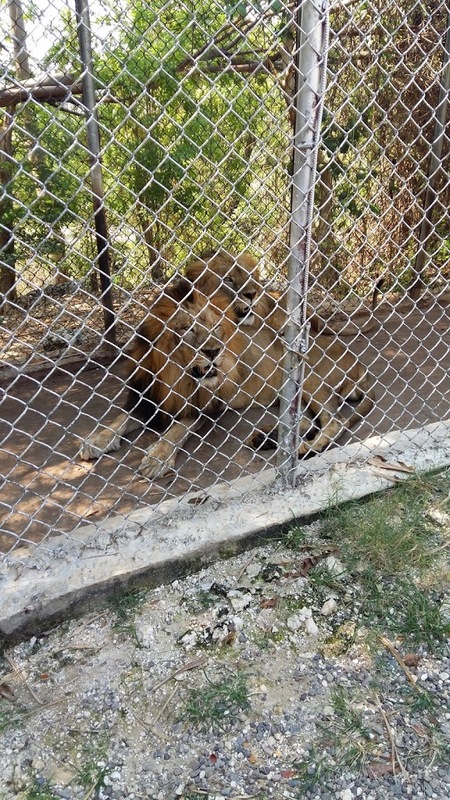 Who wants to be alone… Lonely looking animals in cages make me saddish too. But as H said what do you expect at a zoo. C’mon. It is a beautiful site though, and one that I would spend time at, relaxing under the grand old shady trees that are everywhere. I am sorry to see any attraction on my island go underutilized and at risk of closure. The staff at Jamaica Zoo are wonderful, pleasant and engaging people and I hope that something changes soon so that more people can make a living there, so the animals can live happily and comfortably, and so visitors and locals can have a real option for recreation and entertainment. Road Trip Jamaica: Treasure Beach next stop! Driving south was easy. Google maps told us it would take 25 min from Lacovia to Treasure Beach. It took about 45 min as the road was bad in spots. Not bad I-Need-A-4WD for this, but bad-lemme-slow-down-and-avoid-or-go-through-these-pot-holes-carefully. There were many many small plots of tobacco being cultivated in Burnt Savannah. Interesting! 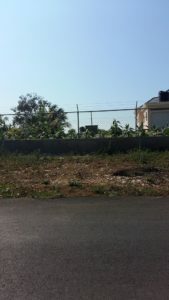 I’m accustomed to seeing plots of thyme and escallion and peppers and cabbage and melons and tomatoes growing all over South St. Elizabeth, replacing the front lawn in many, many instances. But never tobacco. Perhaps they are part of Carreras‘ new tobacco contract farmer programme, aimed at diversifying their product offerings…think “grabba” + ganja. After a beautiful drive through rolling, cultivated landscapes we caught sight of the sea and soon enough, we pulled up at Jack Sprat, the restaurant affiliated with Jakes Hotel, run by the Henzel family. You can check out their cultural roots and history here. 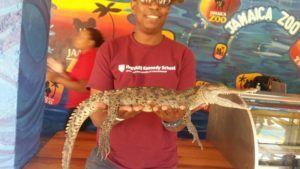 Road Trip in Jamaica: The Food! This is where I really exhaled, and truth be told, was the real aim of this road trip. Jakes and Jack Sprat are one the pioneers of Community Tourism, and their patrons are those who seek an experience that allows them to be a part of the community and true local vibe. 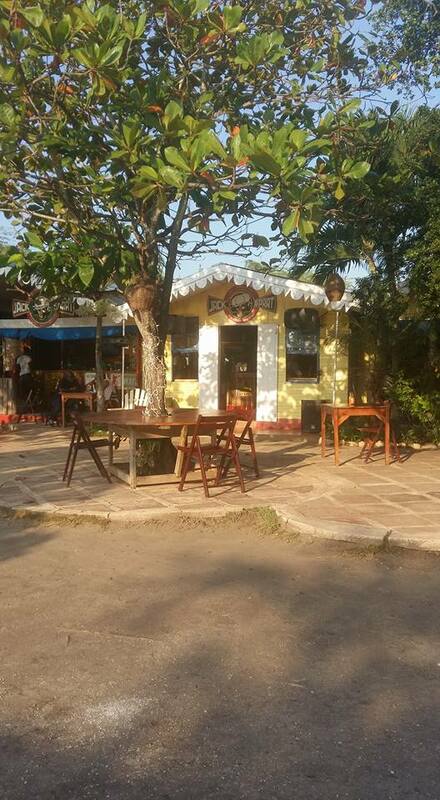 Located right on the sea, you enter and place your order at the bar. The menu is written on the board and prices are fair and reasonable. A pleasant staff member took our order and told us just pick a seat anywhere and she’d find us shortly with our food and drinks. There’s a covered seating area adjoining the bar and kitchen area looking out into the garden area. There are tables and benches scattered under the lignum vitae trees all over the garden. There are seats in the sand in the small cove that you walk down into from the garden. There’s a jetty-like area that’s covered where you look out and over into the serene, beautiful Calabash Bay. That’s where we sat. Heaven. We spotted, much to Bonus Boy’s delight, crabs scampering over the rocks right below us. Gentle sea breezes cooled us and the sound of gently lapping waves perfectly synchronized with tasteful reggae musical selection pumping through strategically placed speakers at the right volume hugged us, cloaked us and reassured us. We were in Paradise. Our drinks and last minute order of soup soon came out. 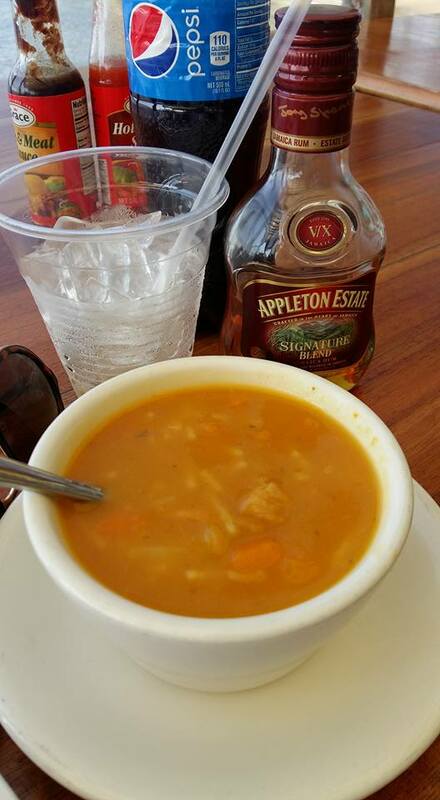 The very pumpkiny conch soup with tender chunks of sweet conch went down real good. Fresh, simple and clean flavours and ingredients are all that’s really needed. Then our lobster and vegetable pizzas and fried chicken and fries for Bonus Boy came out. (He doesn’t like pizza). 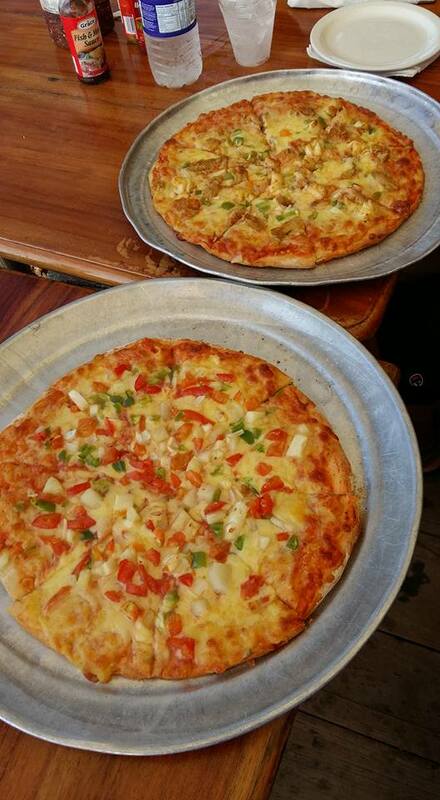 Jack Sprat is famous for their pizza and rightfully so. Fresh ingredients straight from the sea and farm feature: lobster, pineapples, tomato, onion, peppers make their appearance on the pizzas. The crust is thin and crisp and delicious. 100% yummy! 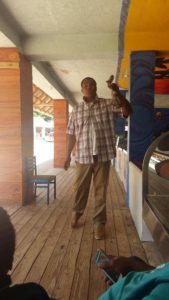 Picture this: the sea and breeze and the music and the rum going down oh so smoothly, and fresh, delicious, made from scratch food… That was us at Jack Sprat. 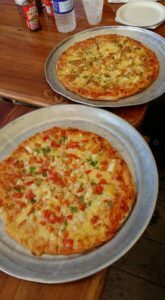 Pizza at Jack Sprat: Their specialty! 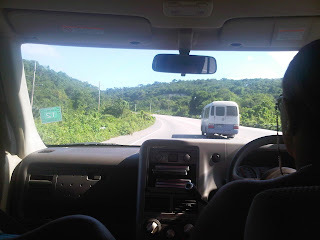 At about 5ish we slowly packed up, small cups of Devon House ice cream in hand (I had the stout ice cream of course), also bought at Jack Sprat, and headed east, back towards Kingston. By a little after 8, we were back. Everything went according to plan and a great time was had by all. This week, a friend asked me how I do all the stuff that I do with the kids. “You must have a huge budget, Kelly!” he remarked. The answer is no. I do not have a huge budget. But when you have kids and you work too, it is critical to do stuff together where everyone (and that includes you!) can relax. You get to de-stress and you build memories too. It is possible here in Jam Down with a little planning. So this post is dedicated to EY. May you have fun times with your girls and build memories for a life-time. Ocho Rios Public Beach, Frenchman’s Cove (Portland), Doctors Cave (Montego Bay), Negril, Ft. Clarence. Any of the above can be done in a single day. For Negril and Mobay, leave home early (think 6am). Buy patties en route for breakfast or make sandwiches from the night before. Pack your own snacks and fruit that you bought in the grocery, and pack water and juices, soda and rum for Mummy. 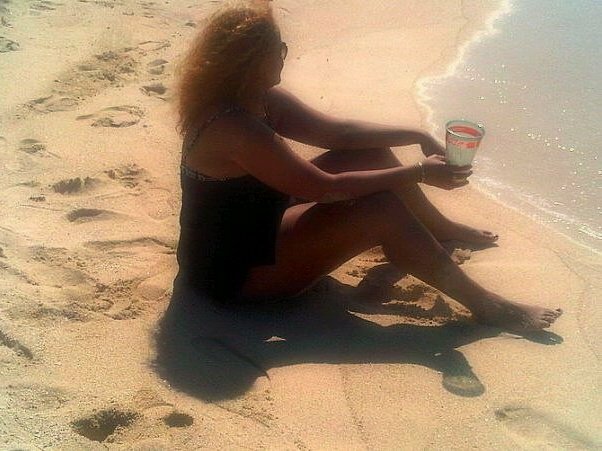 Admission to these beaches ranges from 150.00 per person to 400.00. Now many of these beaches don’t allow you to bring your own food. Some of the food options on the beaches are really overpriced in my opinion. So for those beaches with the expensive options, I still carry my snacks and frozen bottles in my beach bag, and promise the kids to stop somewhere more affordable for food on the way back. This adds another dimension to the road trip. Kids are usually more than satisfied with the low budget options available like BK and KFC, and I also use the opportunity to expose them to various jerk spots and “decentish” cook shops where you can get get good Jamaican food for under 500.00 (there are great places with parking along the Northcoast highway like that spot opposite Green Grotto Caves, Lyming, jerk in Blueberry Hill, St. Mary, Spur Tree curry goat. On every road trip I look out for potential stop-offs and plan for them on my next trip. I think it is now 500.00 for adults and 200.00 for kids. This is a central oasis that doesn’t require big planning. Stop at KFC or your favourite take out place, get your food, carry a blanket (or not!) and head off to the zoo. The zoo has recently been transformed and the grounds which were lovely before with huge expanses of lawn, are even lovelier now with the addition of many many palm trees and the creation of new picnic areas. 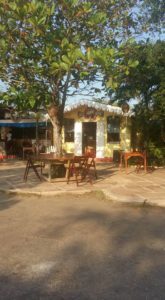 You can picnic in peace and quiet under the mango trees and enjoy the quietude and breeze. The children will enjoy running up and down looking at the animals and you can walk with them or not. It never gets tired. There are new animals with the promise of more to come. There are interactive exhibits where for a little more money (think 200.00 per person) you can feed the birds or pet specific animals. Check it out! It’s a fun, hassle-free way to take a few hours off and just relax. An hour and a half in the gallery on a quiet Saturday morning down town Kingston is a wonderful way to expose your children (and you too!) to another side of our culture. 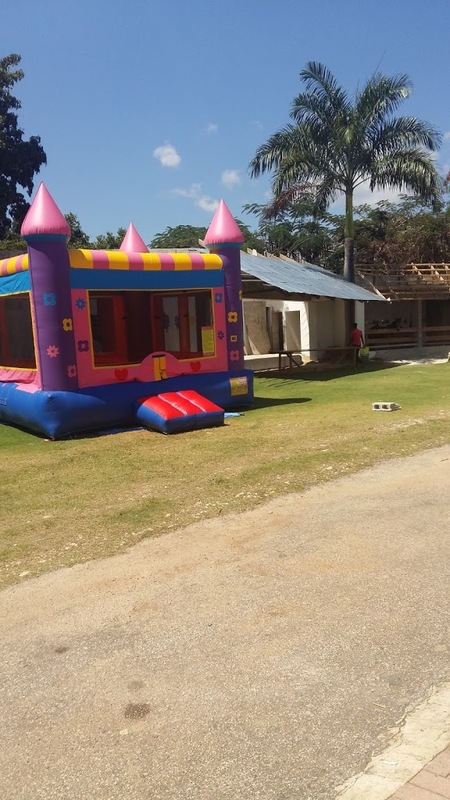 Sometimes there are exhibits and activities there geared towards children. Admission is free I believe. Parking is secure. And when you are finished., just take a walk with your children along Harbour Street. Take them into Burger King for a little treat. Easy, fun and memorable. I could almost copy and paste the verbiage for the National Gallery here. The park is lovely in the evening, just before the sun sets. It’s still light, but it’s cooler. There’s an icecream shop opposite the entrance to the park. Get a single scoop of your favourite flavour and saunter slowly into the park. Chat, walk, people watch and grab a seat on a bench or on the grass. From time to time there are shows there that you can enjoy for free. But even without a show, the park remains a great choice to just exhale and clear your mind. Really young children love it. The huge expanses inspire them to just run, and by the time you get home and bathe them they’re ready to crash! Hint: keep those toddlers awake in the car on the way home so they sleep when you get home, and you can relax with a glass of wine in from of the TV. Heaven! It’s just a 45 minute drive from Papine. Pack a picnic, wear your sneakers, carry your sweaters and lots of drinking water and fruit. A regular car can make that drive. Once there, I think you pay a nominal entry fee (something like 200.00 or 300.00 per adult and way less per child). Park and take one of 2 main hiking trails. Young children can do these walks. Each trail is 45 min long with great views along the way and lots of interesting things to see. Check in at the Ranger cabin so someone knows you are out there. Ensure that you have your cell phone and get to walking. Aim to get there by 10:00 am. and do your hiking then. The afternoons get overcast, misty and rainy…great picnic weather huddled under one of the many gazebos on property. So I love to drive! Grab your favourite music, make a big deal of it, and load up the car. Head out to the lighthouse near the airport. Watch the planes come in, look at the sea. Talk. Collect rocks along the shore. Drive through the more affluent neighbourhoods like Beverly Hills, Norbrook, Cherry Gardens and do some harmless House Hunting. It’s fun. You can chat along the drive. 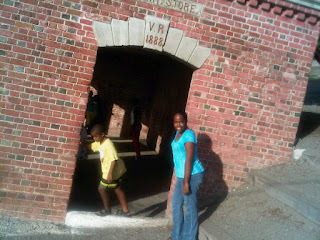 Do the Port Royal Tour. I don’t think it’s more than 500.00 for adults. It’s fun and it’s informative. I highly recommend the Bob Marley Museum tour. Can’t remember the fee, but it is way less than a movie for sure. Even children will find it interesting. Go for ice cream at Devon House. Saturday afternoons are good. It’s not too crowded, and it feels like such a treat to break your day and just sit under a tree or gazebo eating great ice-cream. Mayfair Hotel in Kingston is a great spot for the kids to swim and Mom and Dad to have a drink. For 350.00 you can swim and relax under a huge mango tree out back. There’s a bar and grill. It’s central, quiet and safe. 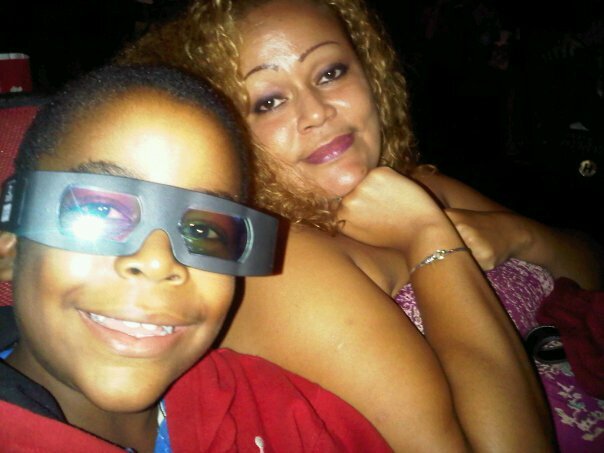 They enjoyed the Pantomime last year too. Save some $$$ and look out for all-inclusive hotel specials and do this once per year. Create your own rituals. In my house, Sundays are special. I throw down on a Sunday and we lounge around at the dinner table for 3 hours eating and talking. Always be on the look out for festivals, free shows, exhibitions, etc that you and your children could be interested in. Naturally, this list is not exhaustive. 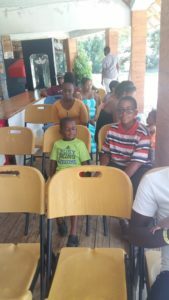 There are numerous big ticket items like the Water Park in Negril, paint-balling in St. Thomas, Mystic Mountain and swimming with the Dolphins. You can plan for these. 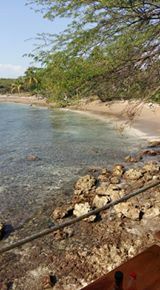 I haven’t spoken about Castleton, heritage stops in various parishes, and the many other beaches around Jamaica Land we Love. It’s always more about building the memories and creating an environment and context where your children feel safe and loved. Have Fun!!!! !